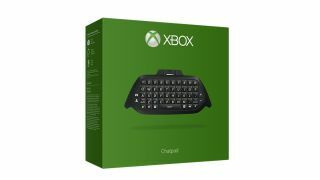 Microsoft has been on a roll with exciting Windows 10 and Xbox One news lately, and it looks like the console's about to get more love with a new Chatpad. Announced during Gamescom 2015, the fully QWERTY peripheral will be released on November 3 and will be compatible with only Xbox One controllers - though it won't ship with a controller itself. Unlike PDP's upcoming remote for the PS4, the Chatpad is a first-party device that will come packaged with a Chat Headset that has 3.5mm jack that plugs directly into the pad. Two new programmable buttons will let you access features like Game DVR, taking screenshots or launching apps - though these won't be available until mid-2016. The QWERTY keypad costs $34.99 (about £22, AU$47). Microsoft is taking preorders now, or you can preorder through Amazon, though the latter site notes a November 10 release.